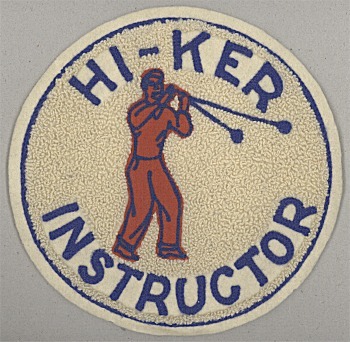 Hi-Ker was the "unpromoted" line from Cheerio. But like many other sub-brands, it was promoted, as this large patch shows. This is large patch, and a velour patch, like the giant Duncan Eagle. These were made for Hi-Ker Demonstrators to wear, and not a contest prize or award. Frequently used on vest sweaters by Hi-Ker/Cheerio demonstrators. Every one of these is slightly different, indicating a template was used and these were hand made by Hi-Ker.